Five years ago today, Old School RuneScape, the vanilla edition of the iconic MMORPG, was propelled into life by a RuneScape player vote and its servers went live. Today, the game that delivers the authentic 2007 RuneScape experience has built on its nostalgic appeal to attract millions of players, become a most-watched game on Twitch and the #1 MMORPG in competitive gaming thanks to its seasonal Deadman tournaments. To celebrate its fifth anniversary, Old School RuneScape today launches its in-game Birthday Event, which will see successful players rewarded with the ultimate Old School prize: the iconic sword, as featured in the game’s logo, as an in-game weapon. Old School RuneScape’s combative player-versus-player gameplay has become a massive hit on Twitch with over 6,000 players streaming the equivalent of 16 million minutes of content and over 3 billion minutes of content watched in 2017. Today, Old School is launching a dedicated Twitch channel at http://twitch.tv/OldSchoolRS, which will kick off with a live 5th birthday show from 7pm GMT. Old School’s PvP play has also has seen it become the #1 MMORPG in eSportsthanks to its quarterly Deadman tournaments, which bring a unique long-form approach to competitive gaming. The Deadman 2018 Spring Finals, which will see the top 2,000 players compete in an unrelenting fight for survival and a $20,000 cash prize, has today been confirmed for Saturday 17th March and will be live streamed on the new Twitch channel. 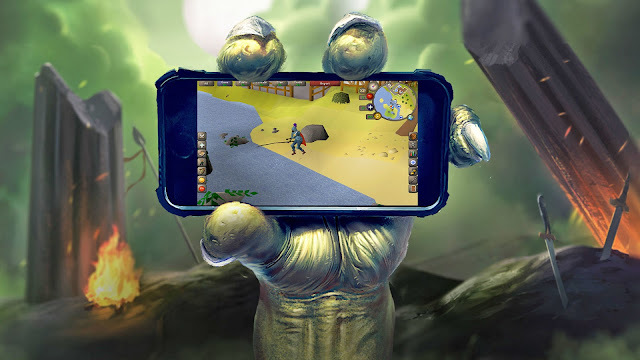 Old School RuneScape is expanding to mobile platforms with full cross-platform play and a mobile-optimised interface. Sign up for updates at https://oldschool.runescape.com/info/mobile.